Charlie Numbelmoore was born near Gibb River Station in the Kimberley. 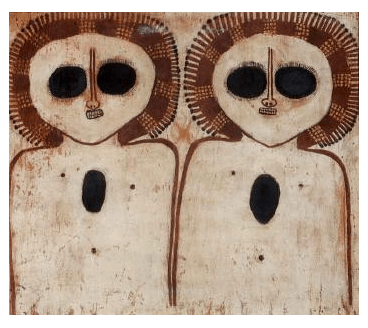 He is famous for his bark painting of Wandjina. He was initiated and repainted Wandjina in rock shelters and caves. 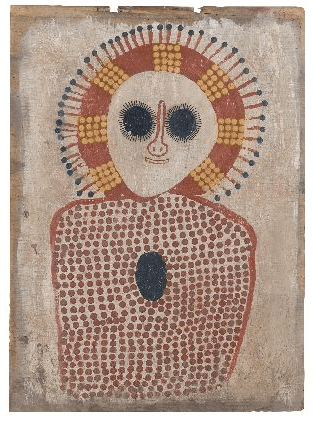 The aim of this article is to assist readers in identifying if their bark painting is by Charlie Numbelmoore by comparing examples of his work. If you have a Charlie Numbelmoore bark painting to sell please contact me. If you just want to know what your Charlie Numbelmoore painting is worth to me please feel free to send me a Jpeg. I would love to see it. 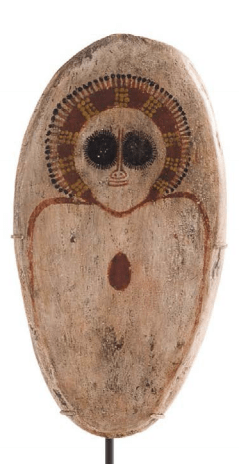 Numbelmoore paintings of the Wandjina are unique and typically have very large black round eyes framed with very fine “eyelashes” in an almost circular head. The eyes are separated by a thin straight nose that flares at the very tip. His earlier works were devoid of a mouth. His later examples have a small mouth that is possibly an addition incorporated after the influence of a European anthropologist. The head is encircled with a red halo with yellow dots. The center of the Wanjina figures sternum is marked in black or red oval representing the heart or a pearl shell. 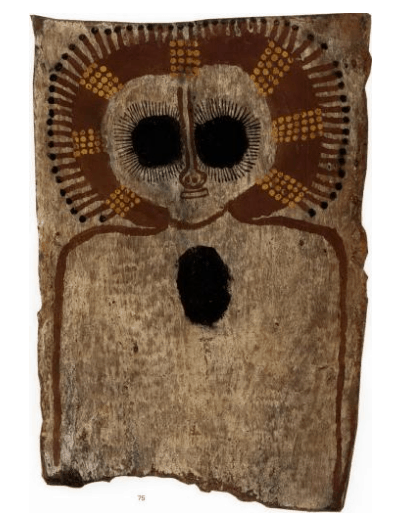 Although Charlie Numbelmoore did numerous bark painting of Wandjina he also did numerous paintings of Wandjina on slate, coolamons composite board and cardboard. He was commercially active in the 1970’s which in terms of Wandjina paintings (not in rock shelters) is early. The following images are not a complete list of works by Charlie Numbelmoore. They do however give a good feel for the very distinctive style of this artist.